Got some extra peaches on hand? Combining fresh peaches and a cake mix are what make this peach cobbler so easy. Of course, you could use canned or frozen peaches instead to make this dessert even easier. Be sure to keep these ingredients on hand, and you can make this recipe anytime. In a medium saucepan, combine the peaches, sugar, 1 teaspoon ginger and cornstarch. Bring the peach mixture to a boil and cook for 1 minute. Pour the peach mixture into the prepared pan. Sprinkle the dry cake mix over the top. Sprinkle the remaining 2 teaspoons of ginger over the top. Take a fork to just mix the ginger into the dry cake mix. Don't disturb the peach portion. Drizzle the butter over the cake mix. 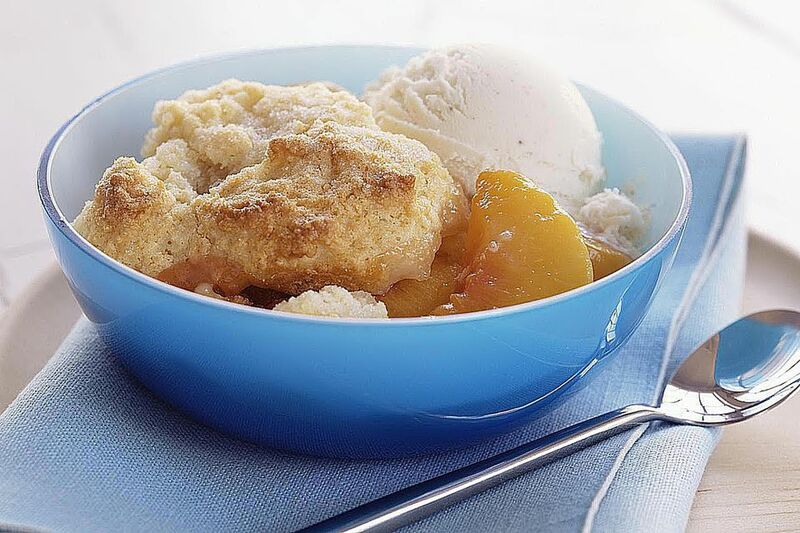 Bake the cobbler for 1 hour or until the top is lightly browned and the peaches are bubbling. We like ours served with whipped or ice cream. This cobbler freezes beautifully. Freeze any leftover baked cobbler in an airtight container to be used at a later date. It will keep it's original flavor for about 3 months. Fried dough is such a treat, especially when its got a sweet outside. Fritters are like doughnuts only there is fruit in the inside. In this case, it's peaches. I use my crockpot for more than just making savory dishes. This recipe calls for a biscuit mix as the topping. Make sure to use really juicy peaches when making this bread. It makes 2 loaves. You can freeze one for later. Did you know that the Peach is part of the rose family? It was originally grown in China. In China, it's well known as a symbol of longevity. The peach got to California first via the Spanish settlers. Both Georgia and South Carolina claim the peach as their state fruit. I believe Georgia peaches are the best, but of course that's because I live here. You may see peaches all year round, but the really fresh ones are grown during a small 12 week period.